Staples’ first trip to the FCIAC semifinal in 4 years brought them back to Fairfield Ludlowe’s Taft Field. That’s where they faced Trumbull in the 2011 final. The Wreckers thought they’d scored, but the referee waved it off. The Eagles tallied on the counter, then added a late goal for a 2-0 win. The 2 teams have had some epic matches since then. Earlier this year Trumbull eked out a 1-0 win. 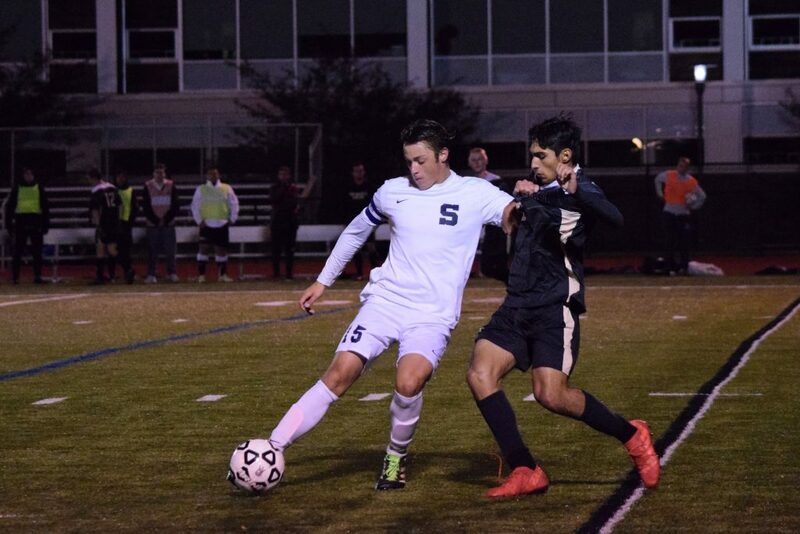 Staples played them evenly — and were denied a tie only when keeper Christopher Prizio saved a penalty kick with 4 minutes to play. For several years, the Eagles have stymied Staples with their physical play and air attack. This year’s Trumbull team plays strong possession soccer, and boasts Jason Weinstein, the school’s all-time leading scorer. The Wreckers shut him down before, and vowed to do so again. The game flowed back and forth. There was rhythm to both teams’ play. It was intense. It was tough. It was fun. The Wreckers wanted to attack on the flanks. With Vaughan Sealey working the right side deftly rom midfield, and Nick DiMasi running hard on the left, they often did. Lefty Penderakis held the ball up top, adding another dimension to his game. 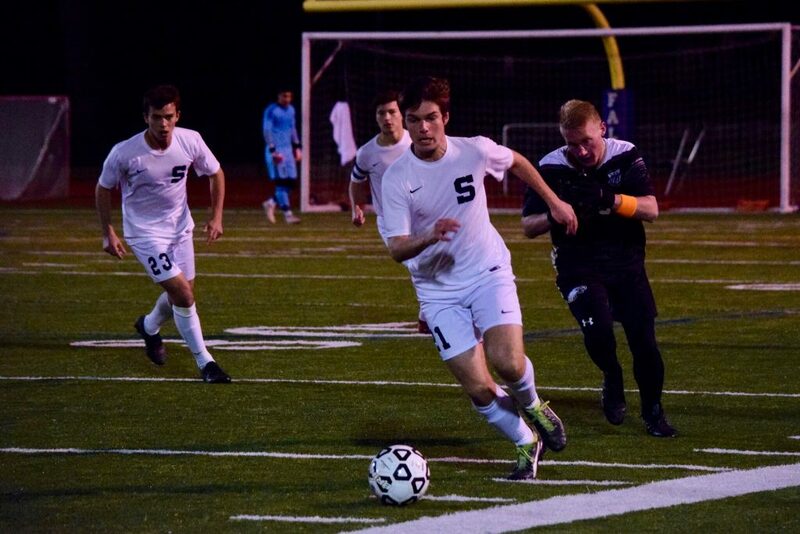 Behind him, Austin Sholes ran the midfield, with plenty of help from Matthew Tanzer. Gabe Baltierra had one of his best matches, winning balls in the air and laying off those on the ground quickly. For 60 years, Staples teams have been known for their defense. Nick Ambrose and Surya Balaji held down the fort in the middle. Rob Diorio had perhaps his best game in a Wrecker uniform on the left. On the right, Patricio Perez Elorza was impregnable, adding excellent runs forward to his tenacious defense. Ry Cohen — the sure-handed keeper — saw few penetrating shots. But he was in command of his box, coming up big when he had to. Mauricio Inglada, Wilson Daniels, Sam Liles added spark off the bench, pressing hard, while Josh DeDomenico added steadiness at midfield. For long stretches of the 2nd half, Staples was knocking on the door. They limited the Eagles to a few long-range chances. But then Trumbull surged forward. It was almost like chess, but played at a much faster pace — and with a lot more physicality. Staples’ best chance came with 15 minutes left. Prizio denied Tanzer, with a superb save. The match continued scoreless — on into overtime. The Wreckers had a 60-40 edge in the first 10-minute period. The 2nd OT was evenly played. Penalty kicks loomed. This was deja vu for Trumbull. On Friday they beat Norwalk in 2 rounds of PKs: 7-5. Trumbull shot first. Weinstein scored. Sholes made his PK too. Cohen saved the 2nd Eagle shooter. But Prizio saved too. The next 2 Trumbull kickers both made their attempts. Prizio saved both. And suddenly — heart-breakingly — it was the Eagles who raced onto the field to celebrate. The Wreckers now prepare for the 3rd season: the state tournament. Pairings will be announced Friday. The first round is next Tuesday — with Staples playing at home. FINAL SCORE: Trumbull 0, Staples 0 (Penalty kicks Trumbull 3-1). SEASON RECORD: 11-3-4. 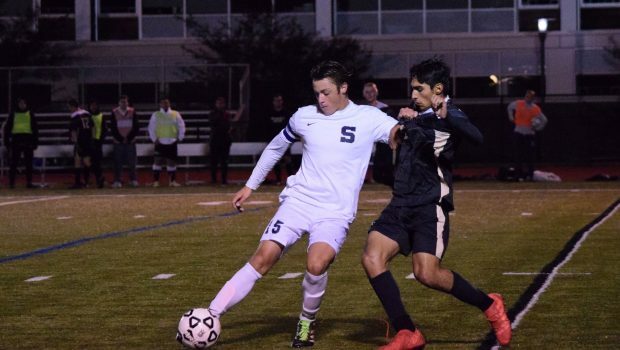 QUICK KICKS: Trumbull was seeded 2nd in the tournament, Staples 3rd. The Eagles face #1 Danbury in the final (7 p.m., Norwalk High School). The Hatters edged #4 Fairfield Ludlowe in the first game 1-0. The lone goal came with 45 seconds remaining in the game…. Backup keeper Sebi Montoulieu came into the game for several minutes, after Cohen injured his wrist. He did not face a shot…. The loss was the first in 10 games for Staples. In that span they were 7-0-3.